Why burn si'ur (partially fermented dough) before Pesach? Here is a time-lapse video of dough rising, shot every 14 seconds for 2 hours. Something nice to share in preparation for Pesach. I've been learning through Mishnayos Pesachim with my son in preparation for Pesach. (b) Siduk [a dough which has cracks on account of Chimutz] must be burned; one who eats it is Chayav Kares. (d) Chachamim say, one is Chayav Kares for eating either of these! 1. Rather, Sei'or is a dough that turned white, like one whose hair stands up [from fright]. So, where does Rabbi Yehuda get this idea that si-ur, partially fermented dough, must be burned, but one who eats it is exempt? פסוק ט"ו: שִׁבְעַת יָמִים, מַצּוֹת תֹּאכֵלוּ--אַךְ בַּיּוֹם הָרִאשׁוֹן, תַּשְׁבִּיתוּ שְּׂאֹר מִבָּתֵּיכֶם: כִּי כָּל-אֹכֵל חָמֵץ, וְנִכְרְתָה הַנֶּפֶשׁ הַהִוא מִיִּשְׂרָאֵל--מִיּוֹם הָרִאשֹׁן, עַד-יוֹם הַשְּׁבִעִי. The pasuk is talking about sourdough, שְּׂאֹר, on a peshat level. But there is an entity called siur, which is consonantally written the say. It is an al tikrei derasha, to read not se'or but see'ur. If so, the pasuk could not be clearer. On the first day, meaning the day before Pesach, remove the se'ur from your house. Thus, burn it. And the pasuk continues to forbid the consumption of chametz, and to associate a penalty of karet with the prohibition of eating chametz. And this is chametz, to the exclusion of the midrashically mentioned see'ur from earlier in the pasuk. So, there is no penalty of karet with eating see'ur. That is Rabbi Yehuda. 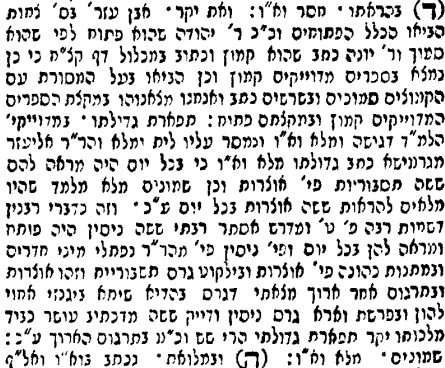 The Chachamim would not adopt this derasha, in which case both see'ur and the later siduk are chametz proper, and would merit the penalty of karet. Rabbi Jesse Horn: What's the connection from the Mishkan to Shabbos? Rabbi Aharon Kahn: Did Both Pairs of Luchos Have the Same Nusach? Rabbi Ephraim Kanarfogel: Is the Torah Written in Chronological Order? Rabbi Michael Rosensweig: Hidden Things? It is almost Pesach, and every year I promise myself I'll write this up, and every year I don't get the chance. There are neo-Karaites in our midst. They shun leniencies which have been developed by Rishonim and Acharonim based on interpretations of gemaras, because they say such leniencies do not reflect the original intent of the Biblical law, or of the Biblical law as envisioned by Chazal. Thus, they save, shaving with an electric shaver is a corruption of this original intent; as is using an eruv to carry on Shabbos; as is selling your chametz for Pesach. One way I like to counter such a position is by turning neo-Karaite myself. You want the peshat? You can't handle the peshat! The peshat in the pesukim is nothing like you imagine. However, Chazal give us midrash halacha. And once you are willing to live and die by Chazal, hem amru ve'hem amru. If by the same halachic principles a ha'arama (legitimate halachic "trickery") is available such that you are working within the bounds of halacha; and sociologically, there is an ethic by which the approach fulfills halachic principles, then please stop complaining. According to the simple peshat in the pesukim, there is no prohibition of owning chametz (leavened bread) on Pesach. There is possibly a prohibition of owning sourdough (se'or), which is used to manufacture chametz. And there is a prohibition of eating chametz on Pesach. The pasuk above states that you should eat unleavened bread for seven days. Therefore, from the first day, אַךְ בַּיּוֹם הָרִאשׁוֹן -- which means the actual first of the seven days, rather than the midrashic day before Pesach -- sourdough, שְּׂאֹר, used in the manufacture of chametz, leavened bread, shall take a rest, תַּשְׁבִּיתוּ , from being used in your houses, מִבָּתֵּיכֶם. Why shouldn't you be using that sourdough to make chametz? כִּי כָּל-אֹכֵל חָמֵץ, for anyone who eats chametz, leavened bread, during those seven days, from the first to the seventh day, וְנִכְרְתָה, shall be cut off. So it is a prohibition on eating chametz and using, or perhaps owning, sourdough. I would say "using", meaning that there is no reason to use sourdough, since you will not be eating chametz. פסוק י"ט: שִׁבְעַת יָמִים--שְׂאֹר, לֹא יִמָּצֵא בְּבָתֵּיכֶם: כִּי כָּל-אֹכֵל מַחְמֶצֶת, וְנִכְרְתָה הַנֶּפֶשׁ הַהִוא מֵעֲדַת יִשְׂרָאֵל--בַּגֵּר, וּבְאֶזְרַח הָאָרֶץ. שאור -שהוא מחמיץ והוא הידוע. ואחר כן אמר: כל אוכל מחמצת כל דבר שיחמץ. ודע כי מיום הראשון עד יום השביעי אינו דבק בקרוב אליו שהוא ונכרתה רק עם אוכל מחמצת, כמו: למלוך שלמה על ישראל. People don't eat sourdough, for it is not ra'uy le'achila. As Rashi says, citing Mechilta and Beitza 7b, אלא שלא תאמר חמץ שראוי לאכילה ענש עליו שאור שאינו ראוי לאכילה לא יענש עליו. See from here that is not fit for eating, so on the peshat level, the Torah wouldn't bother to forbid it. Plus, we have the earlier pasuk to show us the relationship between the seor to own and the chametz to eat. The same is true here. פסוק ג: וַיֹּאמֶר מֹשֶׁה אֶל-הָעָם, זָכוֹר אֶת-הַיּוֹם הַזֶּה אֲשֶׁר יְצָאתֶם מִמִּצְרַיִם מִבֵּית עֲבָדִים, כִּי בְּחֹזֶק יָד, הוֹצִיא יְהוָה אֶתְכֶם מִזֶּה; וְלֹא יֵאָכֵל, חָמֵץ. פסוק ז: מַצּוֹת, יֵאָכֵל, אֵת, שִׁבְעַת הַיָּמִים; וְלֹא-יֵרָאֶה לְךָ חָמֵץ, וְלֹא-יֵרָאֶה לְךָ שְׂאֹר--בְּכָל-גְּבֻלֶךָ. In pasuk 13:3, we are command not to each chametz. In pasuk 13:7, this all falls apart. Because it states that neither chametz nor sourdough shall be seen. Doesn't this then introduce a prohibition on owning chametz, and contradict everything that was specified above? No, it is describing the same state of affairs as above. You aren't consuming chametz, so you would not be producing chametz. Thus, it is a time for matzah, such that chametz and se'or are not going to be seen in use throughout the Jewish community and the borders of Israel, which is בְּכָל-גְּבֻלֶךָ. This is not the same as the earlier מִבָּתֵּיכֶם, which might convey ownership. This is not a new prohibition on ownership of chametz (or se'or) in the boundaries of your personal property. It is describing the lack-of-chametz-consumption-and-creation within the boundaries of Eretz Yisrael, in line with the mitzvot established earlier on. So let us say we wanted to be Karaites, and we sold our chametz. Did we use sourdough (or yeast) to make chametz on Pesach? Did we eat chametz? Does anyone own sourdough nowadays? From the letter and spirit of the law, we are fine. Now, we follow the Oral Law. That means we interpret the pesukim in accordance with the midrash halacha, and so owning chametz and eating se'or are now Biblically prohibited. But the same Oral Law that sets up a prohibition of owning chametz also defines ownership. The Mishna in Pesachim talks about how one can sell to a non-Jew. They may have envisioned the non-Jew taking physical possession. Though this was not (necessarily) envisioning a sale from a Jew first. ב,ג נוכרי שהלווה את ישראל על חמצו, לאחר הפסח מותר בהנאה; וישראל שהלווה את הנוכרי על חמצו, לאחר הפסח אסור בהנאה. חמץ שנפלה עליו מפולת, הרי הוא כמבוער; רבן גמליאל אומר, כל שאין הכלב יכול לחפש אחריו. The correct interpretation of this Mishna is that if it the chametz is a pledge from the Jew for the loan and then the Jew fails to repay the money, the pledge has belonged to the non-Jew from the time the Jew gave it over, and so the chametz is permitted in benefit. And in the reverse situation, where the non-Jew gave the chametz as a pledge and failed to repay, the Jew was in both physical and legal possession of the chametz throughout Pesach, and so the chametz in prohibited in benefit, for something wrong was done by the Jew. But one can envision that if the chametz was in the Jew's physical possession but not legal possession, then nothing was technically violated. Finally, if something will physically remove your ability from accessing the chametz, it is as if destroyed. Think about this and see how it is somewhat significant. Chazal elsewhere say that bittul be'alma sagi, mere nullification is enough. This nullification is either declaring it hefker, ownerless, according to some, and according to others, distancing it from your mind, such that you do not consider it anything more than the dust of the earth. The latter interpretation is (IMHO) the correct one. Thus, small amounts of chametz in a wall or in a vessel are nullified. And this "technical" bittul is sufficient. However, perhaps as a fulfillment of one interpretation of tashbitu or as a geder to prevent you from finding a tasty loaf (gluska yefifya) and then taking possession of it, or perhaps as a geder to prevent you from eating it, you are supposed to search out the chametz and dispose of it. Due to historical developments, the practice of selling chametz arose. People who owned massive amounts of whiskey would no longer have to dispose of their entire inventory at a loss before each Pesach. They could sell it to a non-Jew. And it worked, even though it was perhaps a haarama, that is, halachic 'trickery'. Just like the Talmud allows or recommends halachic loopholes in other situations, such as bringing produce into the house through the window or roof so as to exempt it from terumah and maaser. Big deal. Society changed, from the time of the Rishonim and early Acharonim. Baruch Hashem, most Jews do not stock their pantries with the bare minimum of food, which is all we can afford, and which could (in all instances) be easily finished before Pesach. We have full shelves, and refrigerators, and freezers. Halacha and its application develops over time, and now it is an accepted practice in some communities. Just as the Rishonim worked within the bounds of the halachic system to allow for a changed situation that was common in medieval Europe, later Acharonim (see e.g. the Chasam Sofer) worked within the bounds of the halachic system to allow for our changed situation. Meanwhile, what do people do? They fence off their chametz, by placing them in specific cupboards and taping those shut. Biblically, there is no sourdough to speak of; the chametz cannot be "seen" (though even this is an overly literal requirement), and the chametz is not going to be eaten. From a peshat perspective, the letter and spirit of the law is being fulfilled. From a halachic perspective, the letter of the law is fulfilled by these machinations. And haarama is not cheating, but is part of the same halachic system. Don't be an inconsistent Karaite, by accepting Chazal's interpretation of the pesukim and rejecting the idea of haarama. The spirit of the law is also fulfilled, as described above. And just like bittul by itself is sufficient, because of technical rules and because one is removing his mind from the possibility of eating it, so does technically selling it remove from one's mind the possibility of eating it. And the geder against coming to eat chametz is also fulfilled. Since the people know that the chametz is not theirs, and they physically cut off their access to it, they will not come to eat it. How do we know that Mordechai married Esther? ז וַיְהִי אֹמֵן אֶת-הֲדַסָּה, הִיא אֶסְתֵּר בַּת-דֹּדוֹ--כִּי אֵין לָהּ, אָב וָאֵם; וְהַנַּעֲרָה יְפַת-תֹּאַר, וְטוֹבַת מַרְאֶה, וּבְמוֹת אָבִיהָ וְאִמָּהּ, לְקָחָהּ מָרְדֳּכַי לוֹ לְבַת. 7 And he brought up Hadassah, that is, Esther, his uncle's daughter; for she had neither father nor mother, and the maiden was of beautiful form and fair to look on; and when her father and mother were dead, Mordecai took her for his own daughter. Thus, in a brayta in the name of Rabbi Meir, we should reread levat as levayit, "as a household", meaning as a wife. And there is Biblical precedent for such reinterpretation. וְגַם-אָמְנָה, אֲחֹתִי בַת-אָבִי הִוא--אַךְ, לֹא בַת-אִמִּי; וַתְּהִי-לִי, לְאִשָּׁה. does he really mean that Sarah is the wife of his father?! Obviously not. There must be some trigger which would influence Rabbi Meir to say this. 1) The word לְקָחָהּ might be a prompt. Elsewhere, lakach is used to denote marriage. This then matches the prompt in Shmuel Beit where it states ובחיקו תשכב. 2) More importantly, there is the jarring statement that וְהַנַּעֲרָה יְפַת-תֹּאַר, וְטוֹבַת מַרְאֶה. Why, when speaking of her parents' deaths and Mordechai taking her, would it be relevant that she was of beautiful form and fair to look on? He should have adopted her as a daughter nonetheless, even if she was of green complexion! Rather, this would be a reason he would marry her, and thus stands as a prompt for Rabbi Meir's derasha. However, the scope of statements such as וְהַנַּעֲרָה יְפַת-תֹּאַר, וְטוֹבַת מַרְאֶה are much narrower in the midrashic world. We don't look to context of surrounding pesukim to understand the import. That would be significance minimalism and context maximalism. Midrash is significance maximalist and context minimalist. 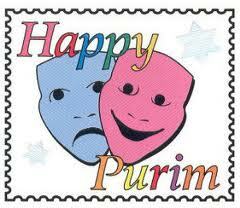 Check out Judaism.StackExchange.com for a whole slew of questions and answers pertaining to Purim. 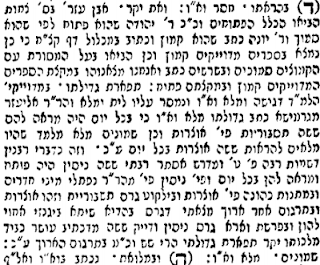 In מגילה דף יב it gives two reasons as to why Vashti did not go to Achashveirosh when he requested her to the party. The first reason is that Vashti had Tzarat (a metaphysical skin affliction). The second is that גבריאל (the angel) made her have a tail. 1) What is the difference between these two answers? They appear to be some physical affliction that prevented her from going. If I have one, I don't need the other. 2) How does a person grow a tail? Why would the Malach choose to make her have a tail? Is there some significance? 3) Is this to be taken literally? 4) Why in the second answer is גבריאל mentioned? Why didn't he bring about the Tzarat? 1) Indeed, if you have one midrash, you don't need the other. This is likely a disagreement, rather than an assertion that both happened. The word nigzar also occurs by Uzziah, a king who brought ketores, though he was not a kohen, and was stricken with leprosy. Meanwhile, the brayta presumably derives the tail from some other source. According to Tosafot HaRosh, it is the word עָלֶיהָ in the same phrase. Written with an aleph instead of an ayin, it would be read alya, which means a tail. 2) A person grows a tail suddenly as a result of a miracle. While I'm sure some people explain the significance of specifically a tail, I would personally note that the rules of midrashic interpretation will restrict the details of the midrash to specifically that which can be deduced from the pasuk via midrashic rules. This was a means of suddenly marring her beauty, such that (based on the context of the gemara) though she would normally have loved to lewdly display her naked body, here she was embarrassed. 3) It depends. I would say yes, the rabbis who wrote this did intend them literally, though we do not have to agree that it historically occurred. Alternatively, it is meant metaphorically. See my discussions of this here and here. 4) I don't know. Different midrashic authors might mention different details. I don't know what specifically brings Gavriel in here, or if there is a running tradition of Gavriel secretly guiding all sorts of events in the megillah. For example, see Megillah 16a, where Shamshai the scribe erased what Mordechai had done to save the king from Bigtan and Teresh, but the angel Gavriel came and rewrote it. Note also that the entire second answer is in square brackets in our gemaras. I am not sure what that means, or what alternate girsa exists there. 1. Torah codes in Megillat Esther. 2. Some fun sources on the megillah. 3. Some more Minchas Shai on Megillat Esther. 1. YU Purim To-Go, 5772. YU Purim-To Go and another roundup from the same source. Rabbi Natan Slifkin has the Ultimate Ban, which someone (it seems from Queens) wrote up five years ago. The chiyyuv, or issur, of getting drunk on Purim. In which I seriously explain how nishtaneh hateva applies. Purim Drunkenness -- an abomination! Missing the beginning of megillah leining. Rav Yaakov Emden's Eight-legged camel. The Vilna Gaon on the trup in megillat Ester. R' Zechariah ben Saruk's perush on Megillat Achashverosh. This year's kol koreh -- the tznius of eyebrows and eyelashes. Whether there are plot holes in megillas Esther. 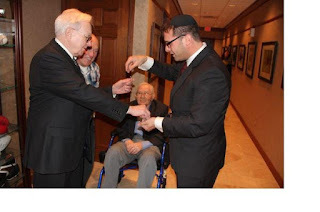 Paying taxes on mishloach manot. The prayer for an edible matzah. Laining the megillah by day and night. Purifying the megillah - a kol koreh. Not my own, but a woman laining megillah cast as a chumra. Purim Torah. The dangers of taking midrashim figuratively, about Esther's green skin. Further perils of taking midrashim figuratively, about Vashti's tail. Bush's Daf Yomi shiur, which started as a Purim spoof. With Purim approaching, it may be a good idea to keep this possible repercussion in mind. Dual Etymology in Esther's Name, and the hidden miracle as a theme present in the megillah itself. The start and end time will naturally differ based on your own zip code, so check them out for yourself. consult your Rabbi for details. Some more Minchas Shai on Megillat Esther. ד בְּהַרְאֹתוֹ, אֶת-עֹשֶׁר כְּבוֹד מַלְכוּתוֹ, וְאֶת-יְקָר, תִּפְאֶרֶת גְּדוּלָּתוֹ; יָמִים רַבִּים, שְׁמוֹנִים וּמְאַת יוֹם. 4 when he showed the riches of his glorious kingdom and the honour of his excellent majesty, many days, even a hundred and fourscore days. בְּהַרְאֹתוֹ -- is chaser vav [J: after the aleph]. וְאֶת-יְקָר -- Ibn Ezra in Sefer Tzachot brings this example amongst those with patach (יְקַר) and so wrote Rabbi Yehuda, that it has a patach, because it is a construct form [the honor of his excellent majesty]. And Rabbi Yona [Ibn Janach] wrote that it has a kametz (יְקָר). And it is written in the Michlol [of Radak] page 198 that so is found in precise sefarim with kametz, and so does the author of the Masoret bring it [in the list] with those with kametz yet are in construct form. And in the Shorashim [of Radak] he wrote 'and we found it in a few precise sefarim with a kametz and in a few of them with a patach. תִּפְאֶרֶת גְּדוּלָּתוֹ -- [Josh: to interject, an וּ is a long vowel, while an ֻ is a short vowel. Long vowels are often in closes syllables, meaning consonant vowel consonant, while long vowels are often in open syllables, meaning consonant vowel. The hard dagesh in the lamed is an example of gemination, meaning the doubling of the consonant, so that the lamed serves as both the close of the previous syllable and the start of the next syllable. This seems strange, for why geminate the lamed to close the previous syllable, when the previous vowel is long? On to Minchas Shai.] In the precise texts, the lamed has a dagesh [to geminate it] and [yet, before it the vowel /oo/] is melei vav [making it a long syllable]. And there is a Masorah upon it that there is none other found. And Rabbi Eliezer of Germeiza [the Rokeach] wrote [about this unexpected vav]: גְּדוּלָּתוֹ is malei vav, for on every day he [Achashverosh] would show them six of his tisboriyot, that is to say, storehouses. And so too is שְׁמוֹנִים malei [Josh: it occurs 8 times malei and 14 times chaser in Tanach] to teach that they were 'full' [to be able] to show six storehouses every day. End quote. Behold there are six. And so is evident from the long Targum." I'll just add that this is the classic approach of remez, to find additional Scriptural allusion to details which were already darshened by more classic means. Rabbi Barry Gelman: Is There Such a Thing as Overdressing...Biblically Speaking? Rabbi Avi Schneider: Wise Guys! Rabbi Shlomo Einhorn: Express Yourself? Rabbi Eli Reich: Do the Clothes Make the Man? Is daber exclusively strong, harsh language? Why Photoshop out women's shoes? Death penalty for mere intent to sell? Do any readers of parshablog read Arabic?